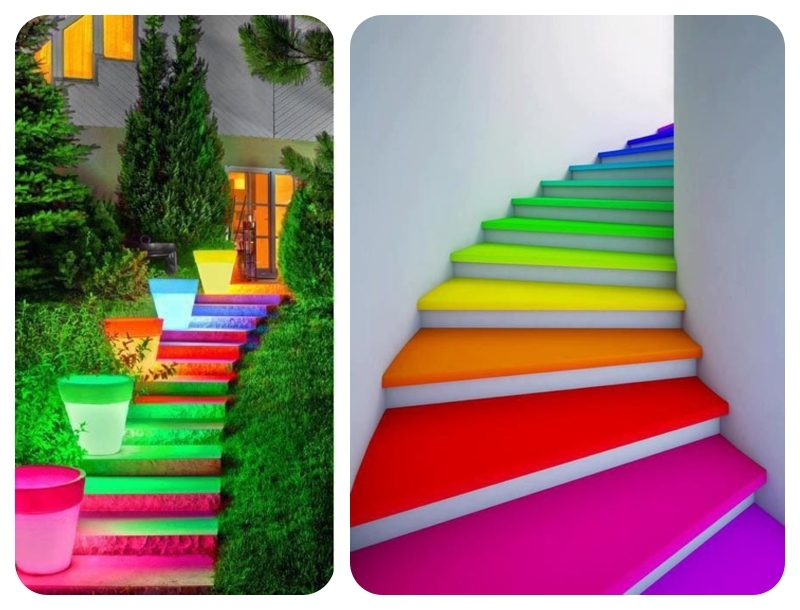 Doing some research on painted stairs and completely bowled over by some of the fabulous images I’ve seen. Time to get rid of that boring beige runner and bring a bit of va-va-voom to your daily step ups! 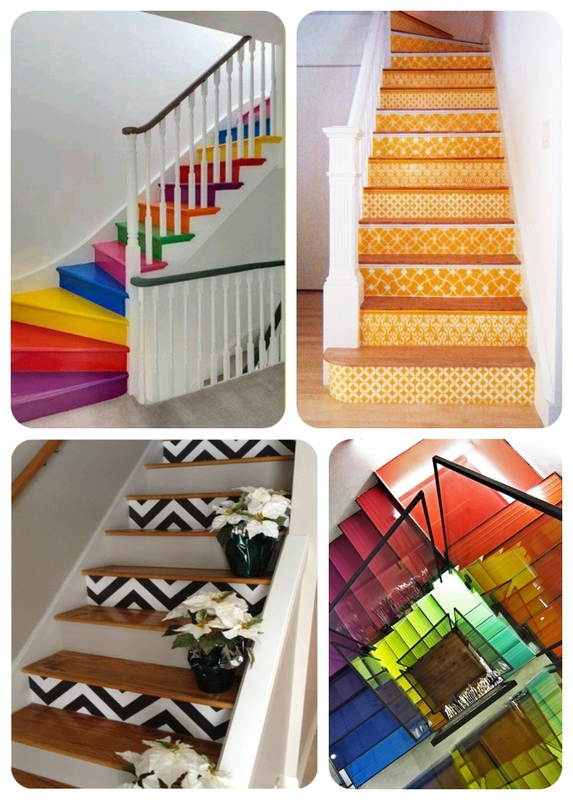 Choose to paint a bright runner instead of carpeting or tell a bedtime story before you’ve even made it up the stairs! I like the contemporary and precise painted line running up the wall featured in the left hand image below. These two are incredibly intricate and stylish, definitely for the more talented artists amongst us. The image on the right is hand painted but I’m unsure whether the one on the left has been created with paint or tiles, the latter would certainly be a durable option. The black and white floral patterned stair risers below look like wallpaper. Keeping the treads white with white walls doesn’t detract from the intricate monochrome detail, very effective. Just because you have period features such as the deep stained newell post on the left below doesn’t mean you can’t opt for a more modern staircase feel. The orange Orly Kiely wallpaper design works beautifully with the natural timbers of the doors and floors. More wallpaper on the left to a staircase on which the risers have been stencilled. Learn how to do this here. Simpler but equally effective is to design interest on timber varnished stairs using numbers or words of your choice, whether you chose to leave all the stair treads in timber or paint the side to match the skirtings. Loving the rope handrail too. Two final ideas & two extremes…. 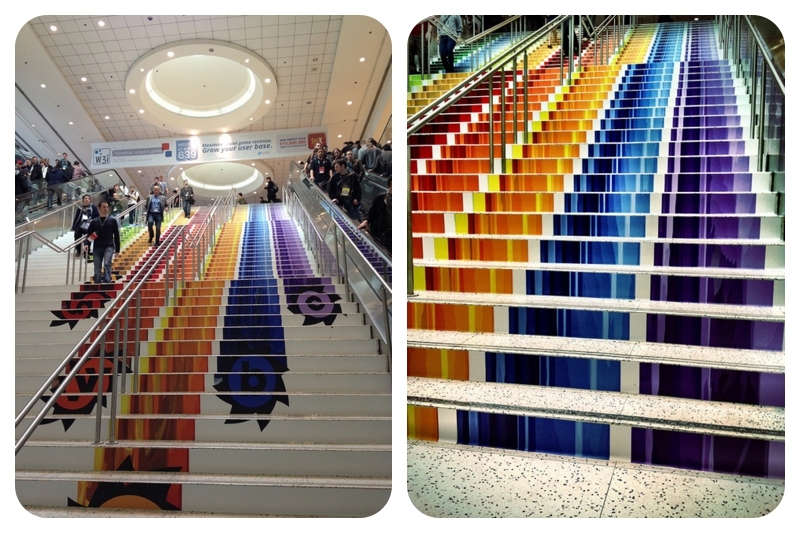 the left a London Design Week installation created using picture frame corners, very clever but only really viable if you have extra wide steps…. and a super simple pared back look where just the edges of the stairs have been painted white. To the areas you are going to paint use a primer first on any bare wood, taping off the areas to be left bare (if any). I use the blue Scotch tape as it doesn’t leave sticky glue behind like other types do. Use a hard wearing, durable and suitable paint, i.e. not wall emulsion. Think about whether you want a gloss or matt finish (matt might not show the dust so much?). Ask for advice at your local paint suppliers if necessary. Use a decent brush not a £2 cheapie which will just leave hairs in your fresh paintwork and won’t give a finer smooth line to your edges. I like Purdy brushes. If you are going to wallpaper the risers, the smooth wood must first be primed and sealed with a treatment suitable to allow the adhesive / glue to work. Then use a good quality varnish to seal and protect your fabulous new stairs. Full-on glamorous hallway in communal rental property – Landlords take heed!